Every Jason Statham movie I have ever seen has the same premise the birth of a “Perfect Weapon”. I think I have finally found that in real life with an interview I did with Hjalte Froholdt a young man from Denmark whose father is a Viking (Not the fake Minnesota kind) and Mother is a Maori (You know a warrior from Tonga). This 6’5″ 275 lbs High 4 star Defensive End who played at Warren Harding in Ohio last year and is not certain where he will play this year is a man child. He is huge and fast and strong. He is everything you want from a Defensive Lineman. The main issue is he is halfway across the world right now and that is hard for schools to recruit him but he is worth the effort in my opinion. 247sports ranks him a 4 star and the 59th best prospect in the country. Scout ranks him a 4 star and the 15th best DE in the country. ESPN ranks him a 4 star and the 14th best prospect in the country. Here is the interview for your reading pleasure. Hjalte- My mom’s name is Lisa, she grew up in New Zealand till she was 16, then her family moved to Denmark (a part of my mom’s family originated from Tonga, a little island outside of New Zealand). She has a Ph.D. in Human Factors and works for UN. My dad’s name is Hans, and he grew up on a little island in Denmark. He was previously a captain on big cruise ships. He has a MBA in logistics and works for Siemens. My sister Lea (22) just started studying Medicine, and my brother is in his last year of “Danish High School” where he is studying business and trade. He also plays Handball (EU sport) on a very high level. I grew up in a little town called Svendborg on Fyn (one of the Islands in Denmark). We just recently moved to Sweden, so I could play better football in Copenhagen and so my mom could be closer to work. 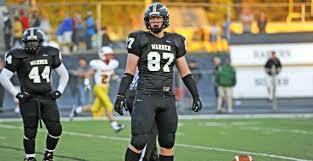 Hjalte- Height: 6’5”, Weight: 275 lbs, 40: haven’t tested but between 4.9 and 5.0, Bench: 300 lbs, Squat: 500 lbs. SYR- Tell us a little bit about your High School FootBall team such as record and defensive and offensive style. Hjalte- In the 2012/13 season I played for WGH High School in Ohio. I started as TE, DE, and Punter. We had a great RB (LeShun Daniels Jr.) so offensively we were a “Smash mouth football team”. Defensively we ran a 3-4, so pretty basic. SYR- Will you be back in Ohio for your SR year? Hjalte- Right now, I’ll for sure be in the states my senior year. But I still don’t know where yet. SYR- If not in Ohio are you able to play football where you are now? If yes, can you tell us about the team and how it compares to high school football here. Hjalte- Yes. I play for a team in Copenhagen called: Søllerrød Gold Diggers (SGD). Where I play on the U19 team, and the Senior team (20-40 year olds). It’s 11 man ball with college rules. It’s not as intense but it’s a very good club. They have a D-Line coach (Robert Shapel) that’s gonna prepare as good as possible. 1 is Morten Andersen. He’s the first and only Danish player who ever played NFL. And he has the record for most points by any player. Reason why he’s my “hero” is because he started from nothing (like me) and worked his way up. He never quit! And his odds were against him. I already have exposure, and time. He didn’t have either one. 2 is Lawrence Taylor. It’s most by his way of playing. He’s an unstoppable, relentless force, who NEVER quits. Just that mentality is amazing to me. SYR- Do you have a top 5 schools list of where you want to play in college yet? Hjalte- I have 4 schools in the top. No particular order: Michigan, Michigan State, Ohio State and Arkansas. SYR- Do you have a leader if yes who? SYR- When do you plan on visiting Ohio State next? Hjalte- Not quite sure yet. SYR- How often do you hear from OSU and who is your lead recruiter? Hjalte- I haven’t heard from them since I visited them. SYR- Do you know if you will be able to return to play CFB in the USA? SYR- How did you learn about American Football and is it popular in Denmark? Hjalte- When I was 12 I wanted to be a foreign exchange student my 10th grade year. So I started to football, so when I came to America, it would be easier to make friends. That was my logic. Now I just love the sport! SYR- When do you plan to be back in the United States to visit schools? Hjalte- That I’m not only a Viking, but a Maori too! You can follow Hjalte Froholdt on twitter by clicking on @Y3llur. If you love Highlight films his are awesome and there are a ton here at Hudl.